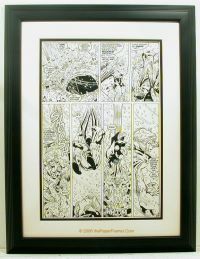 thePaperFramer offers framing for your Comic Art that is changeable and archival safe. 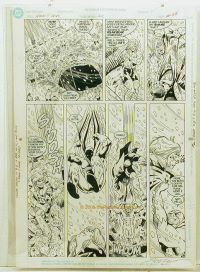 Collecting original Comic Art is becoming more and more popular. 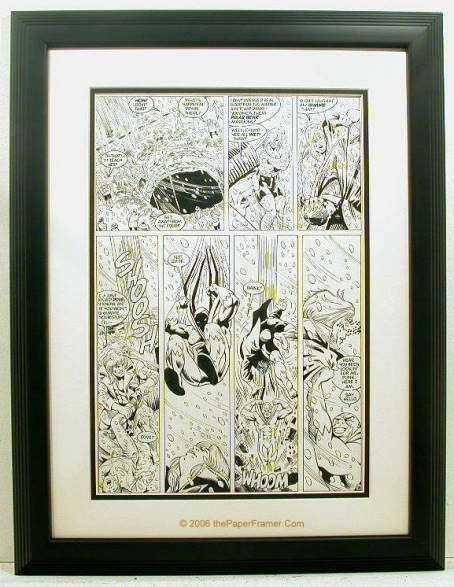 Collectors of Comic Art have to consider how they wish to store and display their art. 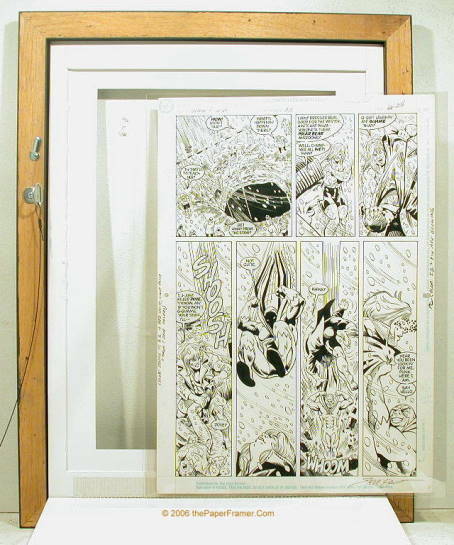 Because Comic Art is gaining value rapidly, the collector needs to protect their collection in the best way possible. Your Comic Art needs to be stored in an Acid-Free environment. According to the US Library of Congress, the preferred material for preserving valuable documents is uncoated archival quality polyester film, such as Mylar® D. Mylar® is an exceptionally strong transparent film that resists moisture, pollutants, oils and acids. With a life expectancy of hundreds of years, Mylar® will outlast most other plastics. In addition, the brilliance and clarity of Mylar® enhances the appearance of any paper collectible. (Mylar® is a registered trademark of DuPont Teijin films. 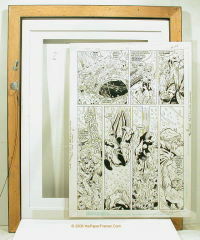 We provide a Mylar® D sleeve with each frame to use with the Comic Art that you display in our frame. 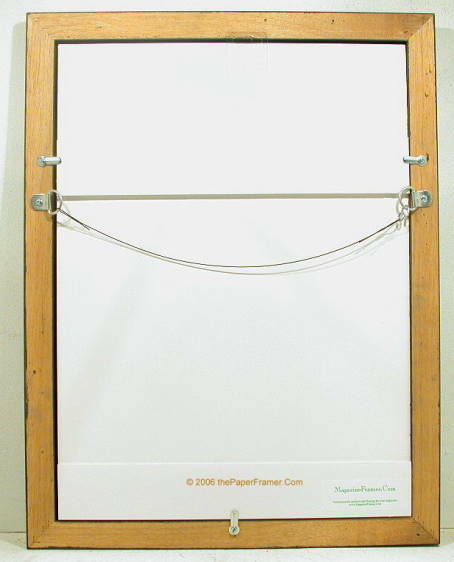 Encapsulating your Art in a Mylar® D sleeve is the best way to store your Art, whether it is framed or not. The other major archival consideration is the enviroment that it is stored in, mainly light and humidity. I can't help you much with humidity, other than to say it needs to be dry. Keep your art out of the basement and other places that are naturally humid. I can help you with light. Each of my frames comes with Framing Grade Acrylic for glazing. If your art is displayed in a fairly dark room, you may need nothing more. You should consider the UV glazing options I offer for other environments. See the "How to Choose Glass and Acrylic" page for more information on these choices. The image on the right shows a completed frame for an 11x17 piece of original Comic Art. While there are an infinite variety of sizes for Comic Art, this is one of the most common. Whatever size your art, be it 6x21 strip art, dailies or others, I can frame it for you. Prices will vary based on the size. Here is your art inserted into a Mylar® D sleeve. 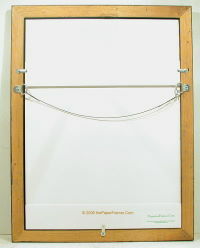 Here the frame with the back opened is shown. The art is ready to be inserted into the frame. Changing your art only takes about 30 seconds. The closed frame is shown here. The changing is the same as for comics and more detail can be see in "How to Change Your Comic".